Rh. montroseanum and Rh. kesangiae. Rh sinogrande is an old plant which doesn't always flower. It has magnificent foliage, the leaves can be up to 80 cm long and are a dark glossy green with a silvery indumentum. It flowers in April and the flowers are large trusses, creamy white in colour with a crimson blotch. It was discovered by George Forrest in 1931 and comes from the Himalayas. Rh. 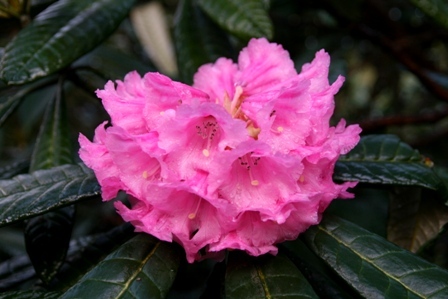 montroseanum is another large leaved Rhododendron which is suitable for woodland gardens. It has long narrow leaves which are dark and glossy and silvery underneath. 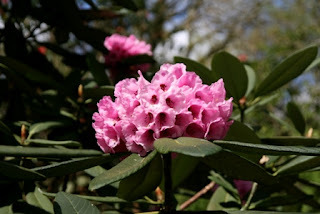 It flowers in April/ May and the flowers are large and pink with a crimson basal blotch. It was introduced in 1925 by Frank Kingdom Ward.